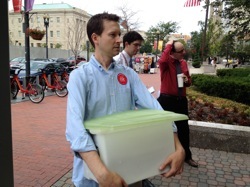 The box was guarded with care, cradled by a DC Public Trust staffer as the group walked down 4th Street to the Judiciary Square headquarters of the DC Board of Elections to turn in their efforts. 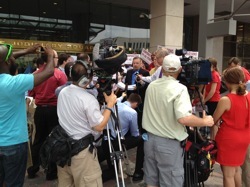 The group, lead by DC ANC Commissioner Sylvia Brown and city advocate Bryan Weaver, collected over 30,000 signatures across all eight wards of the city to put an initiative on the ballot to ban corporate donations to five kinds of political committees, including principal campaign committees (the fundraising bodies used by candidates during elections) and constituent service funds and transition committee funds. The group had to collect signatures from 5% of the registered electorate in DC, or approximately 23,000 signatures, including per-ward totals of 5% in five of the eight wards. DC Public Trust exceeded the 5% mark in six of the eight wards, and each with a cushion of 20% over the required number. Next up, the Board of Elections will verify the validity of the signatures, which can take 30 days, after which time if the required number was met, the initiative will go to the voters on the November ballot that will include the replacement of disgraced Council Chair Kwame Brown, who resigned amid a cloud of ethics investigation and felony counts for bank fraud. On hand to speak, in addition to Weaver and Brown, were Phil Pannell, a ward 8 activist, and Ward 6 Council member (and newly minted mayoral candidate) Tommy Wells, each taking turns to decry the role of corporate money in the local politics.